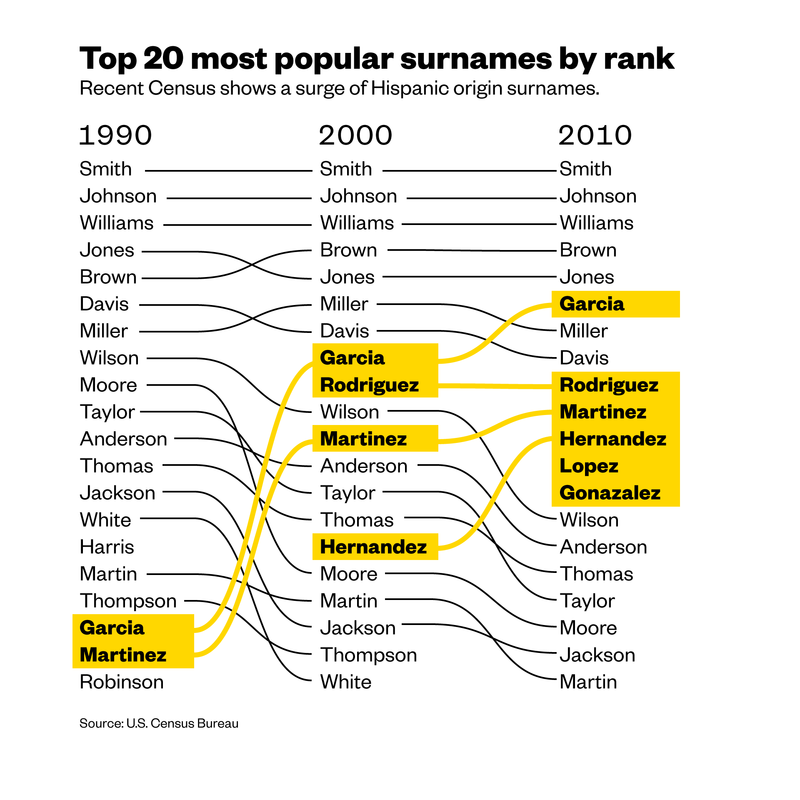 Garcia is now the sixth-most-common surname in the U.S. Sorry, Millers, there are now more Garcias in the U.S.
That’s just one finding from a recent report from the U.S. Census Bureau on the mix of the country’s most common last names. The rise in Hispanic surnames mirrors the surge in the country’s Hispanic population. The Hispanic population in the U.S. grew by 43 percent between 2000 and 2010. That year there were some 50.5 million Hispanic-Americans, or 16 percent of the overall population. The Census classifies Hispanic as an origin, not a race category. This means those respondents could identify themselves as both of Hispanic origin and one of the other race groups. But the growing number of Hispanic surnames among the nation’s most common outstrips the overall growth of the Hispanic population. That reflects the fact that a small chunk of popular surnames covers a great proportion of the U.S. Hispanic population. For example, 25 percent of Hispanics share the top 26 surnames of the most common 1.000 surnames. In comparison, the most common 26 surnames cover less than 1 percent of the white population. In terms of overall growth, Asian surnames saw some of the biggest jumps between 2000 and 2010, according to the Census Bureau. Surnames like Zhang, Li, Ali, Liu, and Khan top the list of the fastest growing, though their large percentage-point jumps reflect, in part, a smaller base to begin with.